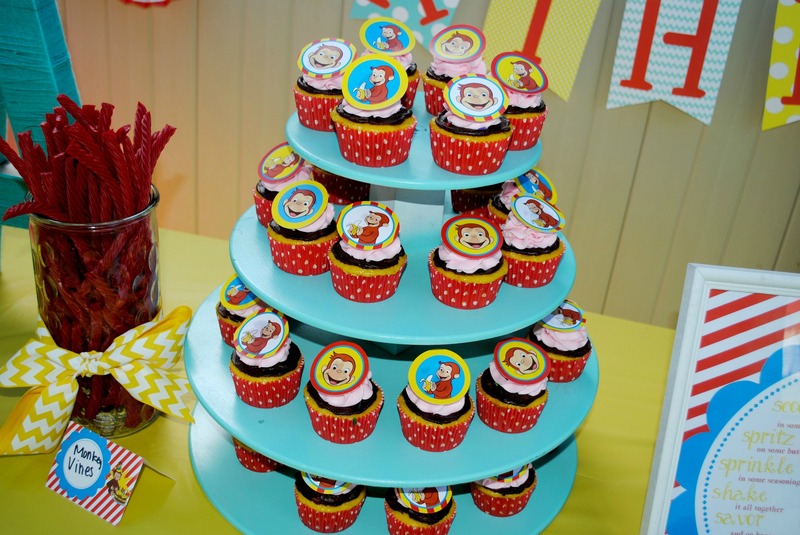 Curious George Birthday Party -- Free Printable's! 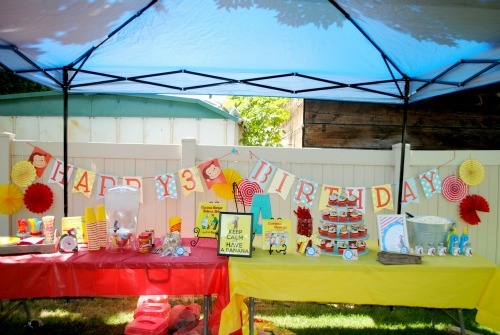 Curious George Birthday Party on a budget– LOTS of free printable’s! 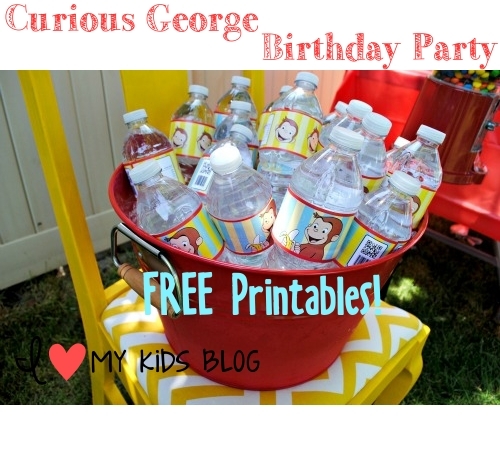 I am amazed at the amount of people who have read and used these printables for the Curious George Party! Thank you all for your interest! I have had plenty of people ask me to personally send them the banner that I made. I was getting so much interest that I have added it into this post now.It is below this paragraph. I will say that I made this thinking I would only use it. So just beware that I made this for me and I didn’t mind if it didn’t look pretty when I printed it, but once cut out, it’s fine! It is a 16 page PDF file as well. All you need to do is print and cut. I printed it on card stock paper, then cut out each letter by cutting on the lines (some lines are more visible than others). My daughter loves Curious George. She actually loves him SOOO much that I am pretty sure she loves him more than me. For her 3rd birthday she obviously wanted a Curios George Party. I was a bit hesitant at first, but I figured I would try and make it work. 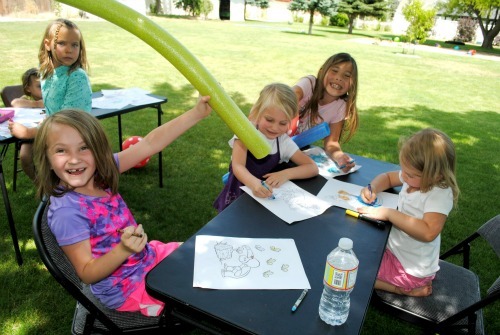 This was her first birthday party that she got to invite her friends (not just cousins). I tried to figure how we would make it work on such a small budget. I knew parties were expensive and I couldn’t afford to spend $200 on the spot. Luckily she chose her party theme early enough that I was able to take a little bit from each pay check and buy things for the party. This helped tremendously and I was really able to make the party look fancy and not spending a huge amount of money 1 week before her party. Here is a rundown of our partay! So here is our final table. It consisted of two tables, with lots of fun goodies and decor. We were going to feed everyone lunch, but we opted to just do little snacks. We had make your own sandwich. It wasn’t your ordinary sandwich, it was PB&J or…peanut butter and banana. WE actually had a few people who made a peanut butter and banana sandwich. It doesn’t monkey-er than that. Probably the saddest thing about this is that I didn’t get a close up of the Popcorn bar! 🙁 I was so so sad. I do have a free popcorn bar printable for you, so you’ll at least be able to see the cute sign. We had spray butter and 5 different season flavors that we put by the popcorn. This was a HUGE hit at the party! We borrowed Curious George books from our local library and used them as decor on the food table. It was a much cheaper way of decor than buying things. The monkey vines were a huge hit as well. We bought a big bin at Costco for $7! Simple, easy, and cheap! My Mom gave me this cute tray when she moved. It was the perfect addition to the party, and ALMOST the right color. I bought the cute red scale at my local thrift store for $1. I was SOOOO happy! We also had a candy machine at the party that we put peanut butter m’ms in. (It was my sisters) I had a jar that I filled with coins and the kids loved it!! It was cute to see 2 & 3 year olds waiting patiently (as much as they could) just to be able to turn the candy machine and get a small treat. Best party tool ever. I want to invest in one now. My amazing friend made these delicious banana split cupcakes. They were oh so delicious! 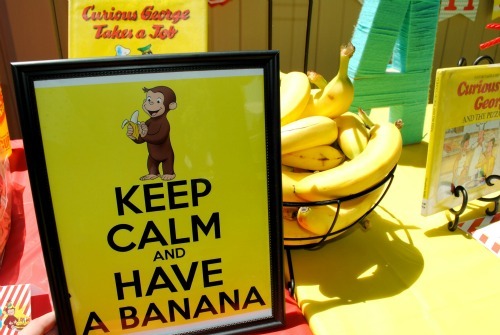 What is a Curious George Party with out banana’s? It’s not. Hence the tons of banana’s we had. Banana’s are cheap and people like them, especially kids! Here is the download for —> Keep Calm and have a Banana sign. I found the water bottle labels on Pinterest for free here is the link. Curious George water labels. 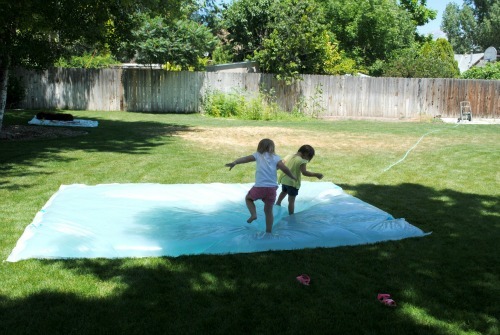 We have a HUGE backyard, so I just let the kids run wild. But here are a few things I had at the party to keep them occupied! My little monkey loves to read. We took our king size pillow topper mattress and then threw the sheet on it and WA-LAH! We have a reading corner! 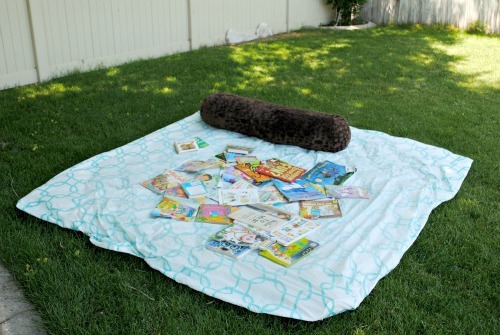 We put it under the shade and the kids loved laying on the mattress reading books. I printed Curious George coloring pages online and the kids loved it. Another party hit. The water blob (Tutorial can be found HERE!) 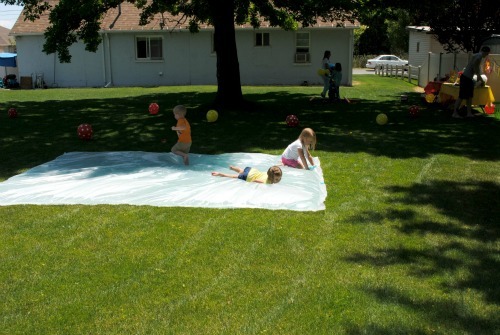 was the BIGGEST hit of all the party….until it had so many holes that the water was all gone. But it was fun while it lasted. This is made from Painter’s Plastic and cost me $10 to make. It was worth being up til 4 a.m. making it. It brought smiles to so many children the very next day. I also have a printable for the food labels, as well as the seasoning label for the popcorn bar. All in all it was a great party and I did lots of easy things to make this cost-sufficient. 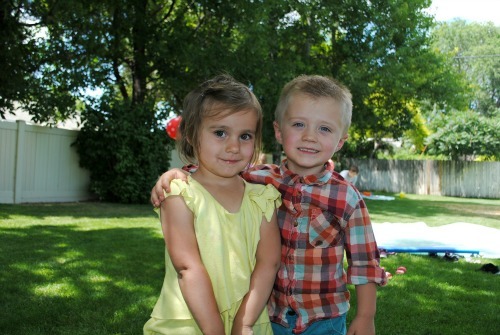 I had to add this one of my girl and the only boy her age that she invited to the party. Aren’t they adorable!? I love this! I hope you enjoyed and this helped you! « Madame Alexander Dolls Are An Affordable Alternative For 18″ Dolls! I actually still have it and I can email it to you if you’d like. Let me know! This was such a fun party. ? Awesome ~ I would LOVE that! My email is [email protected]ail.com. Thank you so much!! Is there any way you can send it to me as well? Do you still have the birthday banner for curious George? so cute! I wish these were pink and yellow and said 2nd birthday! I have included the printable banner at the top of the page. I know but I wanted to know how you made the number as I need to change the 3 to a 1. My son is turning one. Thank you so much for sharing these! My son is turning 3 and these are just what I needed for his party! Is there any way to make a number 2? My twins are turning 2. Just wanted to say THANKYOU so much for giving us moms free printables to save money and make our little ones party so amazing! So glad you posted these!!!!!! 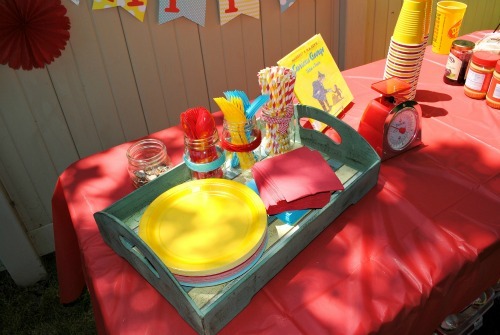 I have been searching everywhere for printables for my sons 1st birthday Curious George/Carnival and havent found much. Love this!! My little boy is in love with curious George so this is going to help a lot!! i was wondering oh could tell me what type of paper you used to print everything on? I am having a Curious George themed second birthday party for my daughter. I just wanted to thank you for providing all of your hard work for us to use as well! It is super cute and helpful and I really appreciate it! Thank you !!! This banner saved my bacon for my son’s birthday tomorrow!! !